Perimeter Solutions & Maintenance specializes in providing both maintenance and signage services to owners and property managers of local businesses, office parks, office buildings, and shopping centers. Perimeter Solutions & Maintenance offers quick, responsive service of the highest quality. Our employees are prompt and effective. We guarantee that both the quality of our work and our employees is absolutely the best available. 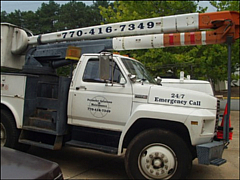 Perimeter Solutions & Maintenance has the equipment and the expertise to handle all of your commercial and industrial property maintenance and repair needs anywhere in the metro Atlanta area. Click on the ‘Contact Us’ tab at the top of the page for information on how to reach us for a quote or for answers to any questions that you may have.